The sixth San Antonio-class ship completed its acceptance trials last week, and the Navy is sure hoping that the future USS San Diego can jump out of the gates after its December delivery without the problems that have plagued the rest of the class. 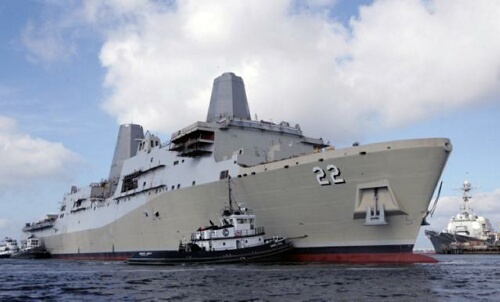 Dock Landing Ship 22 has something going for it: It wasn’t built at Avondale, La. While all five previous 17s have had issues, one, the Mesa Verde, overcame its initial power plant problems and shock trial issues. The Pascagoula, Miss.-built ship is now on its second full deployment, replacing San Antonio, which had to stay home so the finishing touches could be put on a two-year repair job for fixes too numerous to mention. The other Avondale-built 17s had serious issues: New Orleans (propulsion, steering, elevators), Green Bay (steering, engine contaminants), New York (lube oil, bent crankshaft). San Diego was also built at Pascagoula. According to Naval Sea Systems Command, during the acceptance trials, Huntington Ingalls Industries, the builder, “successfully demonstrated” systems ranging from main propulsion engineering and ship control systems to combat systems, communications systems, damage control, food service and crew support, and the Shipboard Wide Area Network. During the at-sea portion of the trials, San Diego “successfully completed” a four-hour full power run, self-defense detect-to-engage exercises, rapid ballasting and deballasting, steering, quick reversal, and anchoring, NAVSEA said. Problems in the first editions of military ships, jets and ground vehicles show up more often than not. But after five of these things, you’d think the design and construction issues would have finally been ironed out. Time will tell.